Members of the Buccoo-based Royal Pan Illusions performs at the National Panorama Single Pan Finals at the Arima Basketball Court last Sunday evening. The band took 15th spot with 263.0 points. The other Tobago band appearing at the finals was Metro Stars, securing 10th spot with 269.0 points. 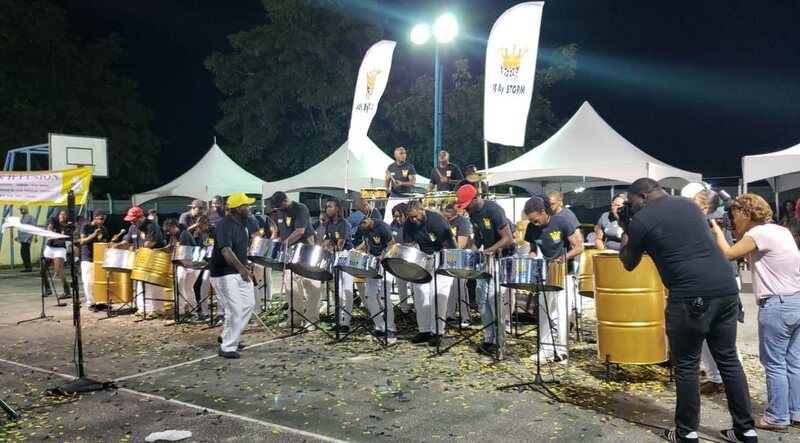 With judging of small, medium and large bands in the preliminaries of Panorama set for Friday and Saturday, reports are that Pan Trinbago, Tobago is yet to receive its annual allocation from the Tobago House of Assembly (THA). Sources told Newsday Tobago on Monday that officials of the pan body and the Tobago Festivals Commission (TFC) headed by Chairman George Leacock have been locked in talks over the past few weeks on the amount due. “In 2018, we were given $1.4 million but this year we are yet to come to a resolution on the figure. We were offered a 12 per cent cut to that figure but we would have disagreed and as a result of that, the talks continue. We now await a date for the continuation of discussions,” the source said. The allocation determines prizes for placements in the Tobago Pan Champs competition which is planned for February 22. The source added that a meeting scheduled for Monday was postponed because of issues at the Commission’s office. On Monday, the TFC said in a press release its offices were broken with several filing cabinets damaged, rendering them inoperable. The TFC said a staff audit showed no items were missing. Chairman of the Pan Trinbago, Salisha James could not be reached for comment. However, PanTrinbago President Beverly Ramsey-Moore, who is also manager of the Black Rock-based Katzenjammers Steel Orchestra, said she was aware of the non-payment of the allocation to the Tobago region as this time. “I am not going to have the information on the region, but I know they have a lot of problems with George Leacock (TFC Chairman) … I would only intervene if things escalate,” she said. Last year, plans to boycott the THA Pan Champs was averted with last minute discussions on an appropriate amount for prize money and collection of gate receipts. Pan Trinbago’s wrangle over money with the TFC follows a similar dispute with the Trinbago Unified Calypsonians Organisations (TUCO) which saw TUCO sending a legal letter last week to Tobago House of Assembly’s Chief Secretary Kelvin Charles requesting that he immediately approve and provide the full budgetary releases and allocations to its Tobago zone for 2019. TUCO also questioned the validity and legality of the TFC. The National Carnival Bands Association (NCBA), Tobago also received no allocation this year, same as last three years, with Chairman Terrance Sandiford, accusing Leacock of running the Commission in a “tyrannical” manner and undermining the organisation. Sandiford said Leaccock called the bandleaders independently and made all arrangements with them. “He don’t deal with the Association, he deals with the bandleaders directly,” he said. Tobago Carnival 2019, with a budget of $7 million, was launched on January 21 with a street parade of masqueraders through the streets of Scarborough. Reply to "George offers 12% cut in funds"